This 36-week course covers the night sky, the solar system, stars, the Milky Way, the many galaxies in the observable universe, the origins of our universe, classical and modern physics, and the latest in theoretical cosmology. Students will gain an appreciation for both simple observation of the night sky and the physics of the universe and its contents. This is a modern science laboratory course developed by a professional astrophysicist and is comprised of both well-established and cutting-edge material, with a strong emphasis on hands-on activities. Students will learn much that is applicable to all of the natural sciences, including some of the history of science, some of the tools of science, and how science works. 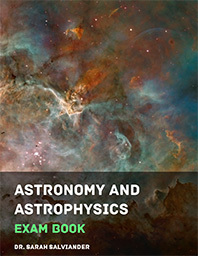 The Exam Book contains exams for each of the seven units in the course along with answer keys. For ages 13+. PDF Format. DRM-free. 69 pages. Homeschooling parents are permitted to use a single purchased copy of the Instructor’s Guide, the Activity & Lab Book, and the Biblical Supplement for their family. A copy of the Exam Book must be purchased for each individual child. Homeschool cooperatives are permitted to use a single purchased copy of the Instructor’s Guide and the Biblical Supplement for their meetings. One copy of the Activity & Lab Book must be purchased for each family participating and a copy of the ExamBook must be purchased for each individual child. Public and Private Schools are permitted to use a single purchased copy of the Instructor’s Guide and the Biblical Supplement for each teacher. One copy of the Activity & Lab Book and one copy of the Exam Book must be purchased for every individual student in the class.